In genealogy, there comes a point in everyone’s research where there are no more records, and no route further into the past. Unless you’re descended from royalty or some other person of historical significance, that path into the past may end within a hundred years, or four hundred years, depending on the location. I have been very fortunate on my mother’s French side to have well-documented Québec lineage, many lines of which can be traced back to France in the 16th or 17th century. 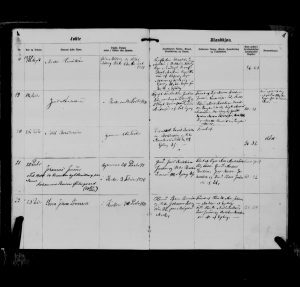 Those records in the French archives are challenging to decipher! On my father’s Danish side, I can trace most branches back to the mid to early 19th century, but I’ve been confounded by one branch where the brick wall is an illegitimate birth. Of course, such a birth was scandalous at the time, so it would not be surprising to have no information about the father. But in my case, I had a name! The birth record (12) of Martin Henriksen in 1877 in Møborg (Rigsarkivet image). 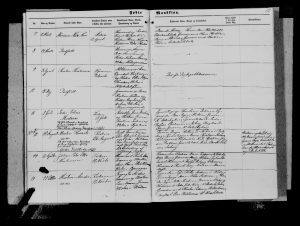 Martin Henriksen was born on 10 August 1877 in Møborg parish of Ringkøbing Amt to unmarried Ane Elisabeth Ingvardsen and unmarried Karl Henrik Lauridsen (as best I can decipher) of Ulfborg parish. The note in the last column of the parish record is of particular interest (my transcription and interpretation). Moderen opholdt sig 10 mdr. i Ejsing Sogn hvortil undfangelsen er sket. Faderen har skriftlig erkjendt sig paterniteten (faderskabet). It was typical of the youth of lower-income families to work outside their parents’ home, and quite often in a different parish. In this case, Ane was working in Ejsing, likely as maid. My understanding of parish obligations is still minimal, but I believe there was some form of subsidy for unwed mothers from either the parish where they conceived or gave birth. In this case, the impregnation occured in Ejsing, so I also checked the parish register there just in case there was additional useful information. As was typical for the time, there was also an entry there. The record (0) of Martin Henriksen’s birth in Møborg in the Ejsing parish (Rigsarkivet image). The notes within this record note the father’s name as Karl Martin Henriksen of Ulfborg parish. I see this as a bit suspicious; it seems more like a recording error, with the father and son having practically the same name. Or it could be that the son was intentionally named directly after his father? Since finding these records, I have searched every combination of the father’s name I can think of but have found no records that lead me to conclude that my search result is the same person. I will follow up this post with additional details about the various searches I’ve done and what I’ve found. In the meantime, if Karl Henrik Lauridsen or Karl Martin Henriksen of Ulfborg appears in your tree, born around 1850, I would love to hear from you!